Looking for dramatic, elegant, affordable wall art? 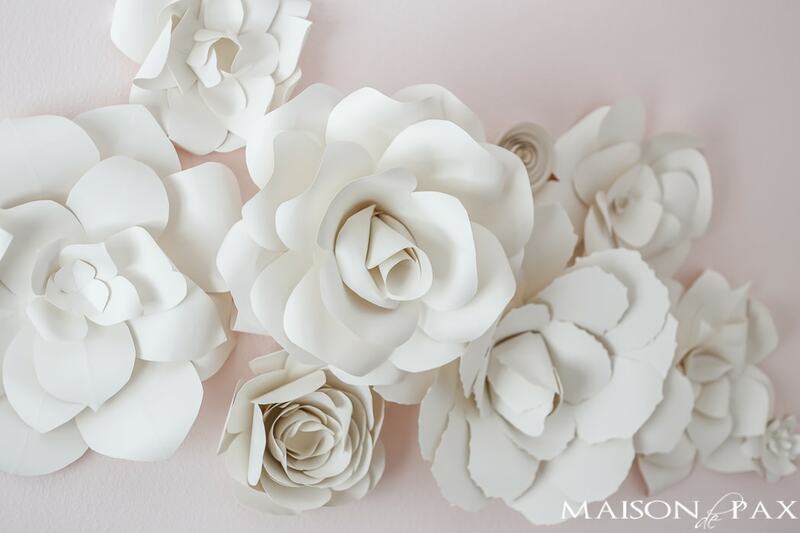 These diy giant paper flowers are simply stunning, and they would make the perfect backdrop for a wedding, party, nursery, little girl’s room, or any elegant feminine space. I have been known to survive on dry shampoo and diet cokes. And I often pretend I don’t notice when my kids eat off the floor. Heck, sometimes I even pick it up and give it to them myself. 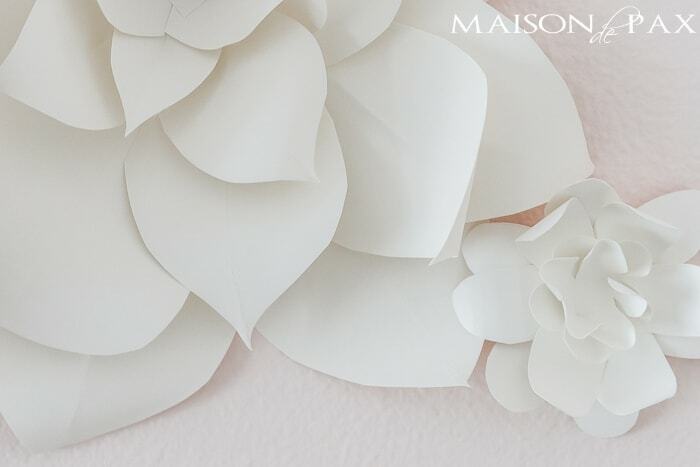 The reality is, I’m not the most elegant, formal, refined gal around… But the paper flower wall I made for my daughter’s new nursery has me feeling like pearls, heels, and champagne all the time. 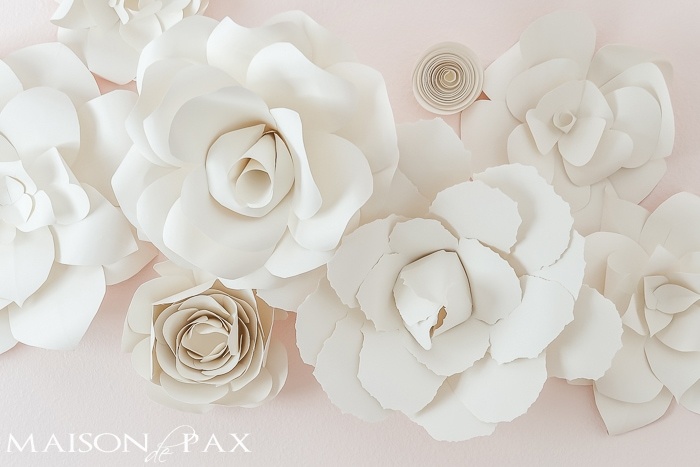 Rather than writing a step by step tutorial for all nine of the different flowers I made, I want to give you a general instruction for how to create giant paper flowers… The possibilities are endless! Also, I want to say that while I adjusted the size and some other details, I was particularly inspired by several tutorials, including this gardenia, this rose, and this ranunculus. First things first, what paper to use. I admit that I’ve been drooling over these amazingly beautiful handmade flowers for years, but I couldn’t justify $600 for paper wall art. So I did my research and found the perfect paper for this: French cotton paper in Natural (not too bright white, not too ivory) in 118lb weight. And at $30 for 50 sheets of 12×12 (which was enough for all the flowers you see plus a few extra sheets), I thought it was perfect. All of the options and suggestions below can be used on any of the three sizes. The only difference is how large you make your layers. 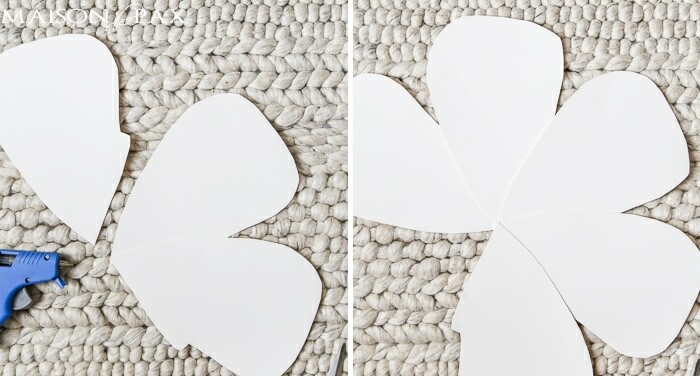 For the largest flowers, you will cut out individual petals and glue them together to make your largest layers. For the medium flowers, you will cut your bottom layers as large as you can on a single 12×12 sheet. And for the smallest ones, you can start with any size layer you want. And for what it’s worth, I simply sketched my petals lightly in pencil. The pencil marks are erased very easily. The simplest is a smooth cut (be sure you are using strong, sharp scissors), but you can also do a wavy cut of some sort. My favorite (but it was more work) was to tear the paper. 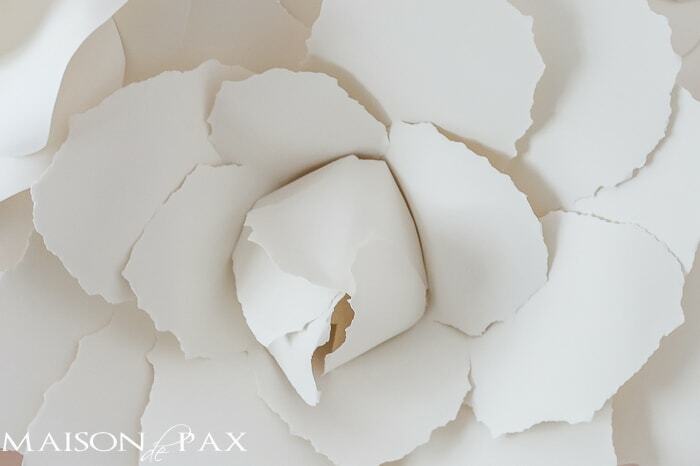 Since the paper is made of cotton, it tears with a front and a back (try tearing it and you’ll see what I mean), so be sure you tear it consistently so that the face of each petal is the “front” side of the tear. Consider adding additional interest to your petals by folding them to create a vein. You will actually want to do this on pretty much every petal even if you do one of the other techniques below. It is the softly curled organic edges that create a realistic feel to your flowers. If you choose flat petals, though, curling can alone create the depth you need, like in this flower. Just curl the edges of your petals softly around that pipe (or broom handle) in different directions to create depth. Another way to create depth is to cut a small slice up the center of the bottom of the petal and then cross one side over the other and glue it in place. This will tip the top of the petal up into the air and give your flower more of a cup shape. A third way to create depth in your flowers is to give each layer a cone shape. 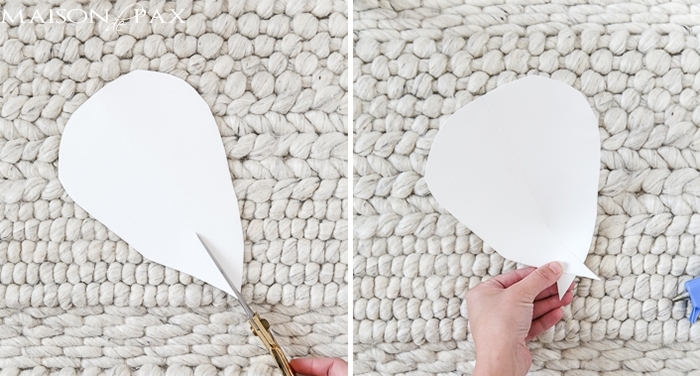 The easiest way to do this is to create your layers 1-2 petals short of a full circle and include a little flap that can overlay (see image below). Then pull the edges together and glue it to create a cone. 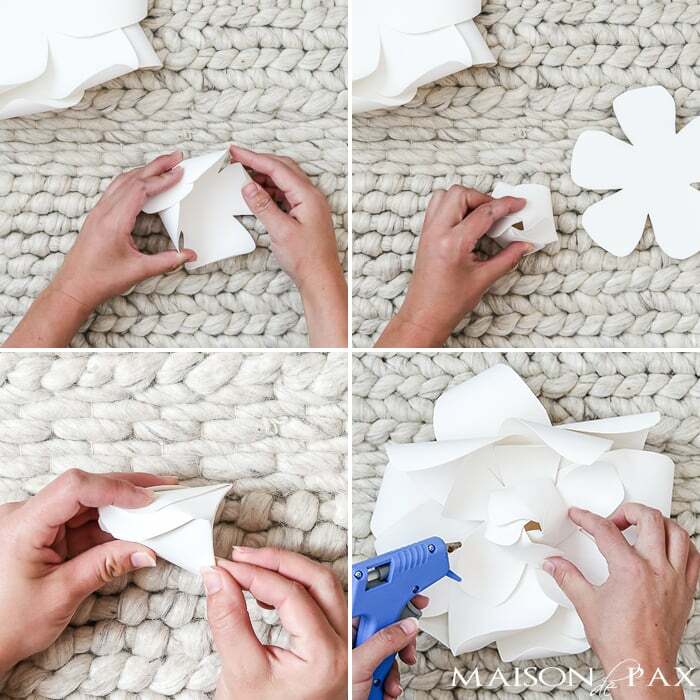 If you are trying to create the largest sized flower, you will need to create each petal with a little extra flap separately (since your paper is only 12″ wide) and glue each petal together until you are one petal short of the full circle. For flowers done like this, you’ll want to start with 1-2 cones of “x” number of petals, then another cone of “x-1” petals, and finally a cone of “x-2” (for example: two cones of 5 petals, one cone of 4 petals, then one cone of 3 petals) so that the cones increase in depth and diminish in size. Whether you start with flat petals, cup shaped petals, or cones, you will want to rotate your layers and glue so that the petals fill in the spaces between one another. For each flower, I started with at least two layers of the same size and number of petals (3, 4, or 5) and rotated enough to fill in between. Here I actually used four layers of 3 petals. For subsequent layers, you can simply cut a slightly smaller version of the same number and shape of petals as your first two layers. I used this method on the full one that mimics a ranunculus. Another option is to change the leaf number in differing layers. For example, in the flower below, I used four layers of 3 petals (pinwheeled and glued), one layer of 5 slightly smaller flat petals (pinwheeled and glued), and one layer of 5 slightly smaller flat petals made into an overlapped bud center (instructions in next section). This is the easiest option. Just cut tiny versions of the petals you used on the rest of the flower and overlap them and glue them in the center. The tricky part is making sure even the base of the petals is attractive (because it won’t get covered up!) and not getting any glue where it is visible. One of my favorite options was to start with a small, 5-petal shape. Curl the edges up and diagonally for interest, then overlap each petal to create a little cone. Once you have them all overlapped, squeeze the bottom edge with your fingers (creating a flat pentagon on the bottom) so that they will stay in place. 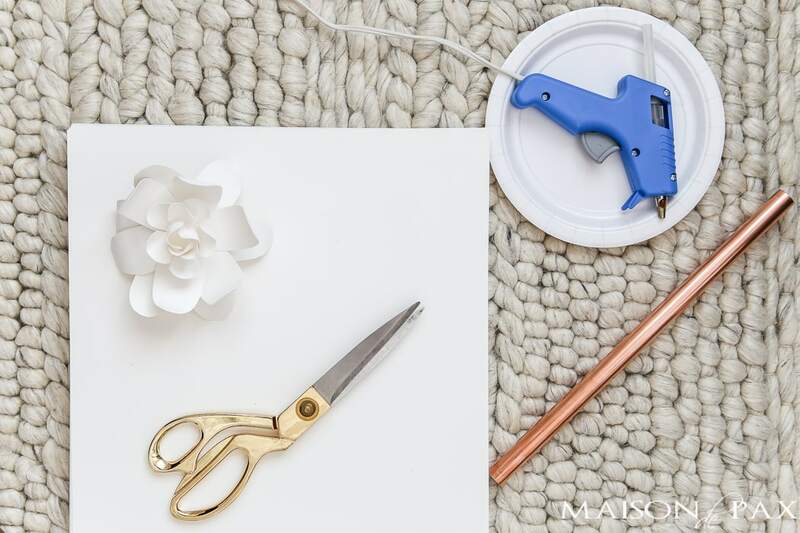 If need be, you can add a drop of glue in a few places to keep the petals from unraveling. Then glue your little bud into the center of your flower. For a petal that begins with cones for depth, you can cut single petals and simply wrap them into cones to create a center. Wrap the petal around a pencil or some other skinny stick to create the cone and glue the paper to itself (not to the pencil!). Then add a second (or even a third) petal around and keep gluing until the center feels full enough. Remove the pencil and insert the cone into the flower’s center. The little spiral flower I made (which I chose to leave just as it was) would also make an excellent center to a larger flower. This tutorial tells you exactly how to make these. And that’s basically it! To give you one more way to think about it, though, I’m going to put one of the flowers into a full picture tutorial for you. Here is the start to finish process for one medium sized flower. I hope you enjoy making these as much as I did. Don’t expect to have them all made in an hour. Give yourself chunks of time to work and time to walk away… But the result will be so worth it! And if you do make some, I’d love to see. These are gorgeous! And they could be used in so many fun ways. Thanks for the tutorial, Rachel! do you have a website with templates? 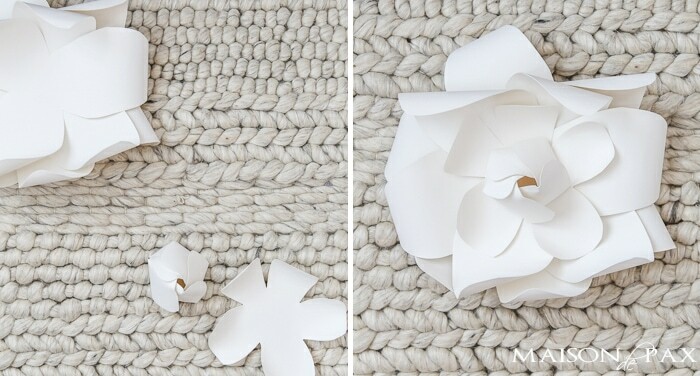 Thanks for the tutorial, if I would like to do this, what to use to create the petals? I just drew the petals free hand and then cut them out from the paper. I hope this helps! Beautiful, I can’t wait to try! Thanks! Hi Rachel! This is fantastic tutorial! Thank you for taking the time to collect all of the details because I have always wanted to make these flowers. I rarely comment, but this blog inspires my home regularly. I really appreciate your creativity and your ability to curate beauty. That is your gift from God. Praying for the safe delivery of your beautiful baby, and safe delivery for you. Thank you so much, Ginni! I am so glad I can serve you by inspiring you and your home. Rosie is here and she is a delight! Thanks again for stopping by. Wow, these paper flowers look so nice. I will try to make it decorate in my room. I think I also can make a bottle flower with it. Thanks for sharing the way to make it. I am so excited to try these flowers. My husband and I are renewing our wedding vows after 35 years of marriage. Like our original wedding our vow renewal will be done on a budget. I literally opened my craft cabinets and pulled everything white, beige and cream out and that is what I will use. I will however buy some paper to make these flowers. (I will scour my scrap booking paper first). Thank you for the tutorial. You are so welcome! And happy anniversary! Hi Rachel, I was feeling the need to be crafty and looked in my emails and there you were. Congratulations on new baby!!!!! Sweet times and blessings. I want to make the magnolia flower and was hoping you have a template. I’d appreciate your help. Ha! I am glad it came to the rescue. Glad you enjoyed the tutorial. Do you make these to purchase? Is that the paper you used? I’m afraid I’m not selling these. The description of the paper used to say country of origin: France, but they seem to have redesigned the page a bit and left that off. It is the same company and same type of paper I purchased, though! I hope this helps! How did you secure them to the wall? I used 3M strips. I had to glue an extra piece to the back of the large cone shaped rose (because the bottom isn’t flat) before I could use the strip, but otherwise they all worked great with small strips! Gorgeous! So elegant. Thank you for sharing! These are so beautiful and elegant! Do you arrange them and secure them together before you hang them on the wall or do you hang them individually on the wall? I am not familiar with the 3M strips so I needed a little clarification. 🙂 Thank you again for sharing! Thank you so much! I hung them individually; I started with the big rose in the center and just moved out from there one by one. 🙂 And here is an affiliate link to the strips I mentioned. Hope this helps! Work? They didn’t have packs of white/ cream at Micheals when I went today. Sure! 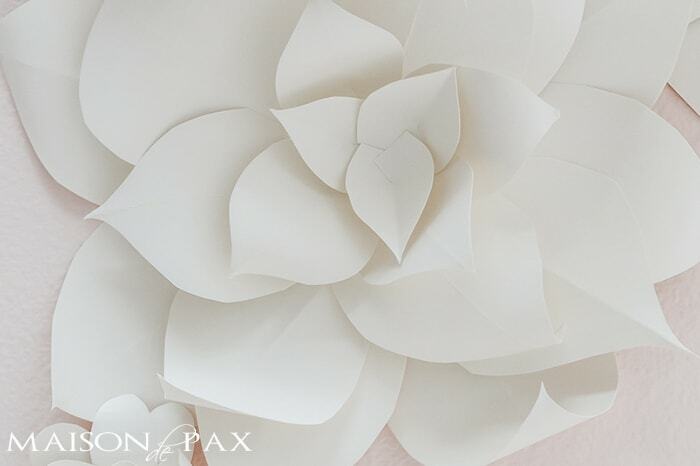 Different paper will have a different look, but assuming the weight is heavy enough for it to hold the folds and curl, I imagine you can create some beautiful flowers! I, too, love the look of these flowers and can’t fathom spending the money on them on Etsy (yet). I am the mother of a 15 month old boy, and 6 months pregnant with a baby girl. I also survive on dry shampoo and coffee, not diet coke lol. But close enough! My plan is to try out one flower and decide if I can do a whole wall. Will probably only need 7 – 10 total, but it depends on the time commitment here. Wish me luck! Thanks for the tutorial! I am so glad you found the post- and good luck! I am sure they will be beautiful. Do you have a link to the magnolia you used? This tutorial is so helpful. I’m doing these for my wedding backdrop. I wanted to do them in my wedding colors but buying the paper in each of my colors is expensive. Could this paper stand up to painting? Do you have any suggestions? Thank you! Actually, I have seen people use latex paint to make flowers, so I think it would be worth a try! Hi Ruth! Thank you so so much for your sweet comment. I put a link to the paper in the post, but here it is again just in case it’s hiding there: https://www.paperandmore.com/product/5678/12×12-natural-white-cotton-cardstock-118lb-cover I hope this helps! Sounds perfect- I am so glad you got to try the tutorial. These flowers are stunning. They just made my day! Also I love the vintage pictures. I love roses. Rachel, I did it! I made the roses and love the way they turned out…they’re beautiful!!! I’m looking at doing this for my daughter due in January. How long did it take you to do all of them? Gorgeous!!! Do you have a video tutorial or one in the works? I don’t, but I have had people report back that they followed the tutorial with success! 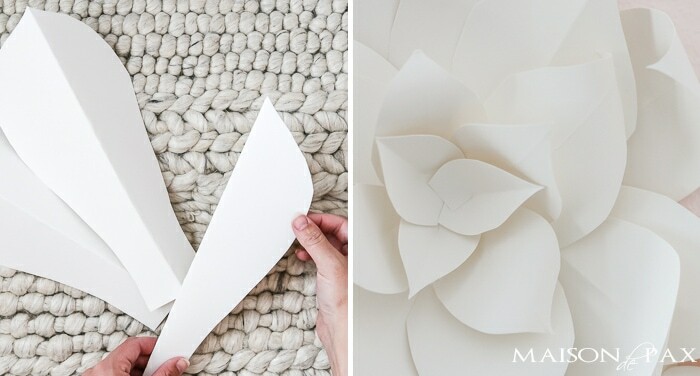 I love this so much, So pretty and such a thoughtful way to make paper flowers. Just fantastic…..
Do you have a template for the Rose (A)? 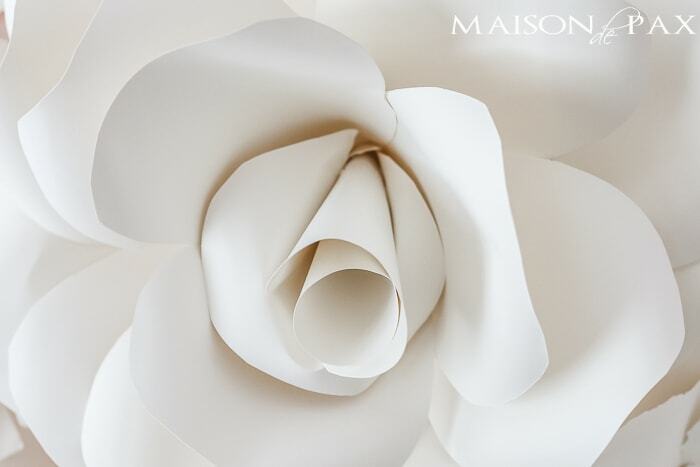 I felt madly in love with your beautiful rose paper flower that I am actually trying to craft one. On another hand, do I need to decrease the petal sizes while moving to the center? I’m so glad you like them! 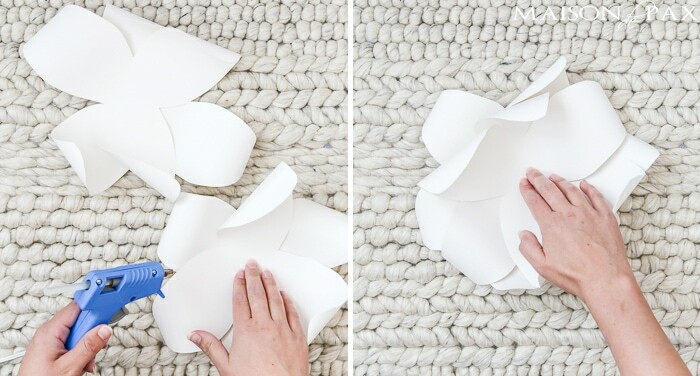 The trick is to make sure that your petals don’t complete a full circle. Glue them together so that they look like a circle with a piece of the pie cut out. Then pull it together and glue it and it will make a cone. Does that make sense? I hope this helps! OMG, I’m so excited right now! I was on Fanciful Design Co’s site last night and was dreaming of their flower installations in my foyer. I just came to Pinterest to search for what more affordable alternatives might be out there. And here you are! I’m so excited to try this! Nervous, but optimistic! You can do it, Liz! Love your website. Will be following. Loved your Christmas ideas. Refreshing! Also, I am definitely going to try the giant paper flowers. This is awesome. Colored papers will also work in so many different ways, for a variety of roses etc. would be a great Mother’s Day gift. I made a set of these flowers for a client and she absolutely loved them. I really enjoyed making them with your tutorial and will be making another set for my niece’s nursery. I ordered the paper you linked and I loved it. It’s the perfect off white color. Thank you so much for sharing this tutorial. I tagged you on Instagram hope I get your stamp of approval. Thank a million. That’s wonderful news! I’m SO thrilled to hear that you found the tutorial helpful and enjoyed the flowers so much. Take care!! Thank you for your tutorial! I want to make these for my daughters nursery. I see on the link provided they have pink card stock but only 100lb weight. What you recommended is 118. Do you think the 100 is heavy and sturdy enough to hold up on the wall? It doesnt say the pink is cotton card stock either. Do you know where I can purchase colored cotton card stock for this project? Does my question make sense(prego brain)? I’m so glad you found it helpful, Ashley!! Unfortunately, I haven’t tried any of the other weights or colors on that website. I will say, though, that I ordered a single 8.5×11 sample from their website when I was trying to find the best weight and color for my project, and it was so easy and reasonable! You might just want to try that in a few weights/colors and see what works best. I hope this helps! Ashley, what did you end up using?? I want to make some colored flowers as well, but am wondering about what paper to use then! I’m considering using the recommended paper and tinting the edges with stamp ink for some color…hmm. Thank you so much for the tutorial. They are so beautiful and dreamy. 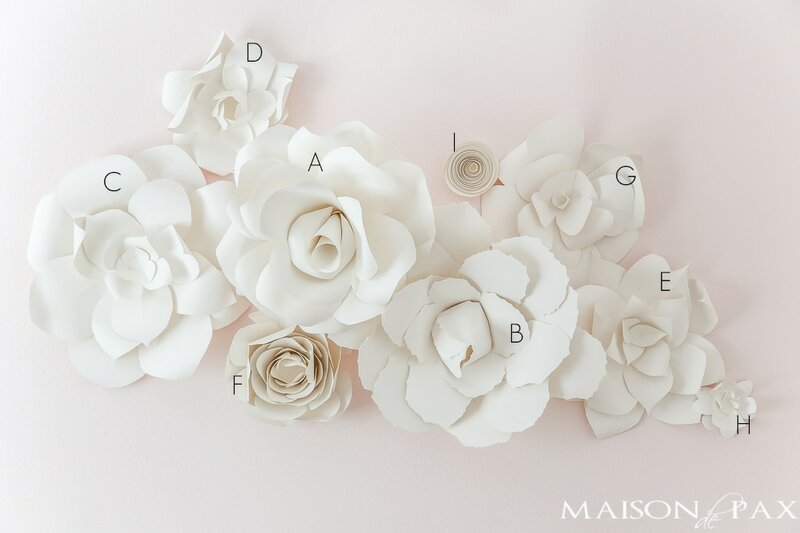 I want to make a flower wall for my wedding. Do you also have a YouTube channel? Thank you so much! I’m so glad you found it helpful. 🙂 I do have a YouTube channel: youtube.com/maisondepax . I do not, however, have a tutorial for these flowers yet (though it is something I am hoping to work on soon!). Congratulations on your upcoming wedding! These are absolutely stunning! Best I’ve seen and I have looked everywhere! I was wondering if you have created a template for these flowers. I have a granddaughter coming at the end of the month and would love to add these to her nursery! I don’t, I’m sorry, but I’m sure they would be lovely for your granddaughter’s nursery. Do you have to use a specific type of paper? I definitely recommend the cotton paper that I linked to in the post, though any thick paper (like cardstock) could potentially achieve a somewhat similar effect. You will need something stiff enough to hold its shape when you roll it. I hope this helps! Hi, I love the flowers you have made. I want to learn how to make these. Do you have a template for each flower that we can follow?It would be easier for me to print than trace. Have a great day! I’m sorry, Lisa! I don’t have a template, I created as I went along. UGH ok! Thank you! I am not that good with freehand. But I will try my best. I’m so glad you like it! I’m afraid I don’t have any pictures, but I basically glued a tab on to the top of the point so that it could act as a tab to put the 3M strip on to. Does that make sense? I hope this helps! Just beautiful..thanku so much for a clear and precise tutorial. Of course! I’m so glad it was helpful and that you are making them! Perfect! So glad to have you! These are beautiful! Are they sturdy enough to dust so they stay beautiful for longer? Would love to make them for a friends babies nursery!